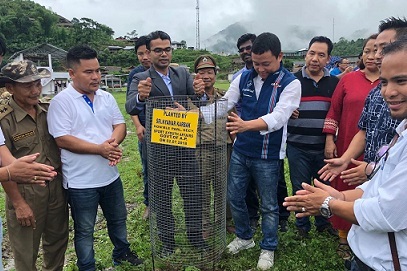 Along with the rest of country, Van Mahostav was also celebrated on Tuesday at the Darak Circle of West Siang district in Arunachal Pradesh for promoting tree plantation in a befitting manner. Attending the celebrations as chief guest, Parliamentary Secretary for Sports and Youth Affairs, Nyamar Karbak in his speech stressed on the importance of flora and fauna for the survival of human beings. “Our planet is the only place that nurtures life so every individual must take care of Mother Earth. Let us all take a pledge to keep our surroundings green and clean,” Karbak said calling upon the people to adopt the ‘Each One Plant One’ theme. Taking opportunity, Karabak, who is also the local MLA, informed that more than a lakh of flower seeds would soon be distributed all across 27 Liromoba Assembly ST Constituency by the Kamba Nursery in an effort to beautify the entire region. Aalo DFO Abhinav Kumar, in his address informed the gathering that the Forest Department’s efforts to conserve wildlife recently bore fruit when the cameras installed by the department captured the movement of tigers in the dense jungles near Boro Rakshap village in the circle. “We were also able to trace tiger pugmarks of different sizes which indicate that there are a few wildcats in the jungle. This is good news not only for the circle but also for the State and the entire region as the population of the species is decreasing each passing day,” he said. The DFO further appealed to the locals to stay away from forest destruction activities and killing of wild animals and birds and said it now fall under criminal Act. Senior forest official Prem Kumar, in his speech, highlighted the way and means to maintain a healthy eco-system. To mark the day, a mass tree plantation drive was carried out at the Darak Township during which more than 300 tree saplings of varied species were planted. Besides, ADC Yomcha and circle officers of Darak and Kamba, PRI leaders, youths and HoDs of the circle also participated in the day-long programme which was organized by the Department of Forest in collaboration with the Kargu Karbi Students Union (KKSU).